In this practice test you will be required to answer all 5 Speed Limits sample questions from Your Keys to Driving in Queensland. You must travel more than 60km/h. 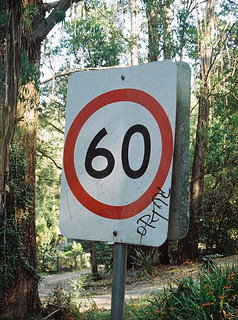 You must not travel more than 60km/h. The next town is 60km away. Can you legally drive over the speed limit? Yes, as long as you do not go over the speed limit by 10 km/h. Yes, when you are overtaking a slower moving vehicle. Yes, when you have a good excuse. the faster you drive, the more time and space you need to stop. increasing speed also increases the severity of crashes. driving too fast around a corner can cause you to lose control of your vehicle. What is the maximum speed limit (unless otherwise signposted) in a built-up area? 40km/h is the advised maximum speed to travel around the curve ahead under good conditions. Winding road for next 40km. 40km/h is the legal maximum speed limit for the curve ahead when the road is wet. You can only turn left for the next 40km.